CelPlan is a leading provider of radio frequency planning & optimization tools, value-added consulting, engineering, and training services to the wireless industry. Whether in the lab, facility, field or across the city, CellSpectrum™ is the only platform that enables universal spectrum analysis and RF path characterization for all wireless communications. The advanced mobile spectrum analysis solution allows for comprehensive drive testing and coverage mapping capabilities. Combined with the ThinkRF R5550 Real-Time Spectrum Analyzer, the advanced CelPlan software enables a number of mobile and drive test applications. 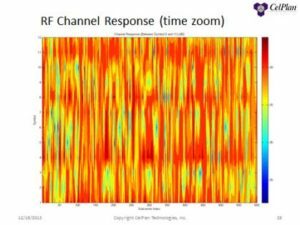 The ThinkRF R5550 Real-Time Spectrum Analyzer integrates with CellSpectrum™ to enable a complete, mobile spectrum analysis solution. The ThinkRF P120 Vehicular Power Conditioner can also be used to power the device from a standard vehicle power source.